Black Friday wouldn’t be Black Friday without a killer deal on everyone’s favorite smartphone accessory. 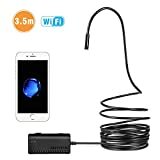 That’s right, the Depstech WiFi Borescope Inspection Camera that connects to your phone wirelessly to let your iPhone or Android device see anywhere is back on sale. This time, it’s been slashed to just $27.99 when you use the coupon code HXROHDCT at checkout, matching its lowest price ever. Tens of thousands of our readers have bought this nifty camera and we constantly get emails from people who love it. Now, it’s time for you to see what all the fuss is about.